Robert Burns’ work still touches people’s hearts after more than two centuries, and in countries far beyond his native Scotland. His themes ranges from the wry wit of The Shepherd’s Wife to the haunting beauty of My Heart’s in the Highlands, to the connections of friendship in Auld Land Syne. As Scotland and the world gear up to mark the 250th anniversary of Burns’ birth, here are several equally creative Scots musicians you’ll want to get to know. 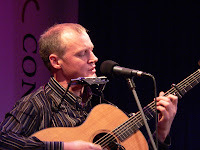 latest recording is a collection of songs by Robert Burns, in fact, including that lively Shepherd's Wife in a duet with his own wife Susie, the eighteenth century antiwar song Logan Braes, and a vivid song of Scotland’s landscape, Westin Winds, along with more widely known pieces such as Ae Fond Kiss and Killiecrankie. Check out Malcolm’s own work, too. Not for nothing has he been recognized with top song writing awards. And he has a delivery so natural that he might be having a conversation with Burns himself. mixes songs from the tradition with her own compositions, and best of all she loves to source or set them in her native Dumfriesshire in southwestern Scotland. Her latest album, Too Long Away, has all of that in generous measure, with rollicking ballads of history, acute observations of day to day life, stories of legend, and a quiet look at a summer evening. There’s a Burns song too, one that finds the raking and rouging poet writing from a woman’s point of view. plays the harp, both the small acoustic sort and the big pedal kind. In her own work she doesn’t draw distinction between folk and jazz, considering them both equally interesting and equally part of the same musical exploration. In addition to creating her own work (her latest album is called Harp I Do) she shares her gifts as a singer in the trio Grace Hewat Polwart, and composes for tlarge ensembles including the folk orchestra The Unusual Suspects. sings in Scots Gaelic, a language she grew up with in North Uist, but which is spoken by fewer than one percent of Scottish people. She does that so well the Scottish Executive recently honored her by naming her Scotland’s first Ambassador for Gaelic, in recognition of her work bringing the language to people in Scotland and beyond. As you tune up for Burns night and beyond, give these musicians a listen. 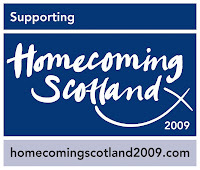 And stay with us here along the music road: especially during this year of Homecoming Scotland, we’ll be featuring the work of many musicians from Scotland, Scottish America, Cape Breton, and other parts of the Scottish tradition.